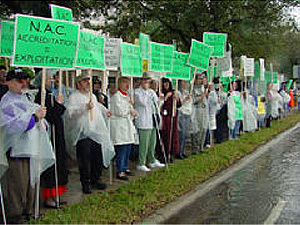 Federationists protesting NAC marched on two picket lines outside the Crowne Plaza Hotel in Tampa. 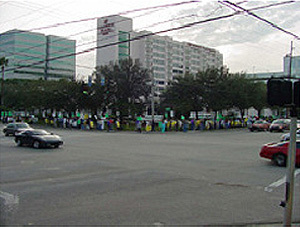 Picketers display their signs and serenade Tampa's morning rush-hour traffic. 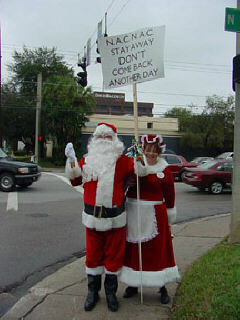 Santa and Mrs. Claus joined our protest against NAC. 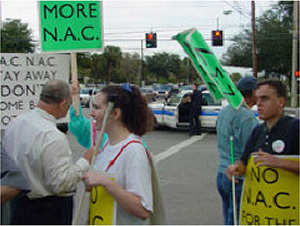 Every marcher wore a cheerful button saying, "All I want for Christmas is no more NAC!" Here two Federationists� can be seen wearing their buttons. At 12:30 p.m. the Green Machine came on duty, followed at 2:30 p.m. by the white team. Then at 4:30 p.m. it was all feet on the street again. 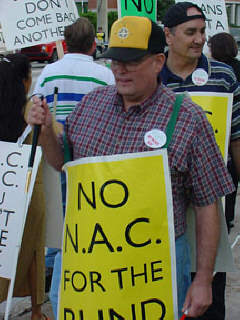 A committee was established to collect signs from one team and hand them out to the next. Aside from several of the signs meeting an untimely death due to saturation and other abuse from the gusty weather, these transitions occurred with amazing efficiency. Throughout the day I ran back and forth, checking with the marshals positioned at the end and center of each ellipse, trying to give breaks to those who needed them and maintaining the integrity of the lines. As was the case with our protest in Portland in October, I was impressed with the stamina, dedication, and lung capacity of our members. Those who attended should be proud, and those who didn't should plan to participate in any such events occurring in the future. After snarling traffic for a while, the Tampa police prepare to leave the marchers in peace. Jim Gashel addresses the Friday evening meeting. 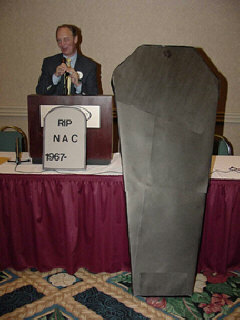 In front of him is the NAC headstone propped in front of the podium, and the NAC casket leaning against the table.